A. Interwoven Teamsite is a content management solution. Teamsite can be accessed using a browser based GUI. B. Every user has a private workarea equivalent to the entire website that is being managed. Teamsite provides a common area called as staging from which content can be deployed to various environments such as Development Environment, QA/ Testing Environment, Pre Production Environment and Production Environment. 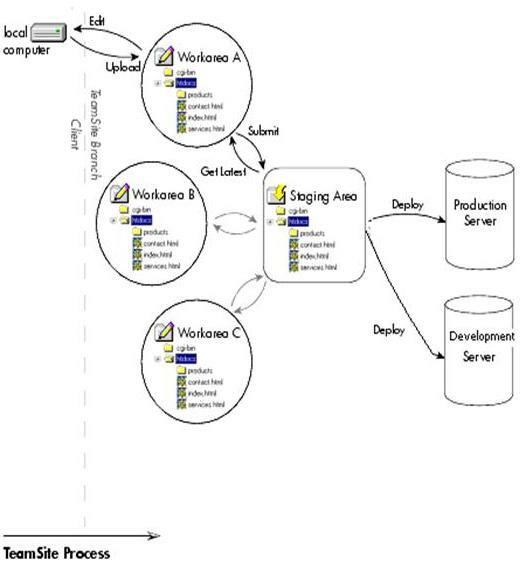 C. The staging environment acts as the content repository. Content can be deployed only from the staging environment. D. The teamsite user can get a latest copy of a file from staging area to workarea. E. Each teamsite user can edit files in the workarea. Such files will be locked for editing so that other users are prevented from making changes to the file. F. The user can submit modified files to staging area. Thereafter, the user can deploy the changes to Production from staging. G. The actions that can be performed by a user are limited by the user role specified on login. The user must have appropriate privileges to deploy content. 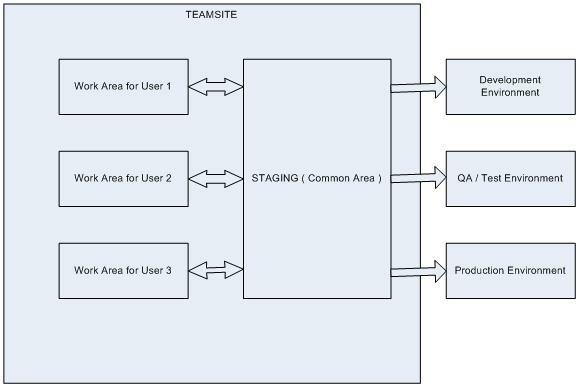 Let us discuss the team site process diagram shown above by taking an example. Let us say a developer needs to change a particular file and deploy the same to production. A. The developer will login into teamsite and do a get latest of the file to be modified into his / her private workarea. B. The developer will then download the file for edit and make the required changes to the file content. C. The next step is to upload the file back into the work area after which it can be submitted to the staging area. D. Once the file changes are present in the staging area, the developer can deploy the changes to the available environments like development, production etc.